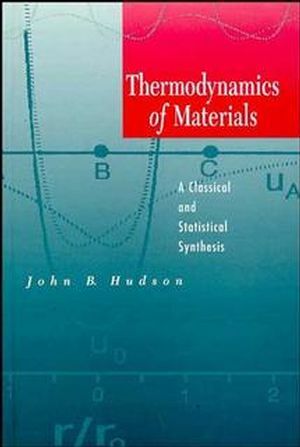 Designed as a reference resource for practicing professionals aswell as a text for advanced students, Thermodynamics of Materialsoffers a lucid presentation that ties together classical andstatistical treatments of thermodynamics within the framework ofmaterials science. Unlike most books in the field, it emphasizesthe natural connection between these two approaches, both as a wayof obtaining useful information about real systems, and as a way ofshowing the relations between the molecular-level properties ofsystems, and their properties on a macroscopic scale. In thisregard, the author's aim throughout the text is to introduce therigorous, general relations that arise from classicalthermodynamics, which are system independent, and then to usestatistical thermodynamic relations to calculate the expectedvalues of the macroscopic thermodynamic parameters of thesystems. Thermodynamics of Materials includes a review of classicalthermodynamics, an introduction to statistical thermodynamics, andnumerous practical problems in thermodynamics, especially thoseinvolving phase and chemical equilibrium. Handy appendices enhancethe value of this outstanding text. JOHN B. HUDSON is Professor of Materials Engineering in the Department of Materials Science and Engineering at the Rensselaer Polytechnic Institute, where he has taught since 1963. Dr. Hudson maintains a research program in the thermodynamics and kinetics of surface processes, and is the author of over 80 papers in this field. He is currently engaged in developing a course sequence linking freshman chemistry and materials engineering, and in applying interactive learning techniques to the teaching of engineering and science. The Laws of Classical Thermodynamics. General Theory of Phase Stability. Evaluation of the Allowed Energies. Classical Thermodynamics of One-Component Systems. The Einstein Model of the Solid. The Debye Model of the Solid. Classical Thermodynamics of Multicomponent Systems. The Lattice Gas with Interactions.